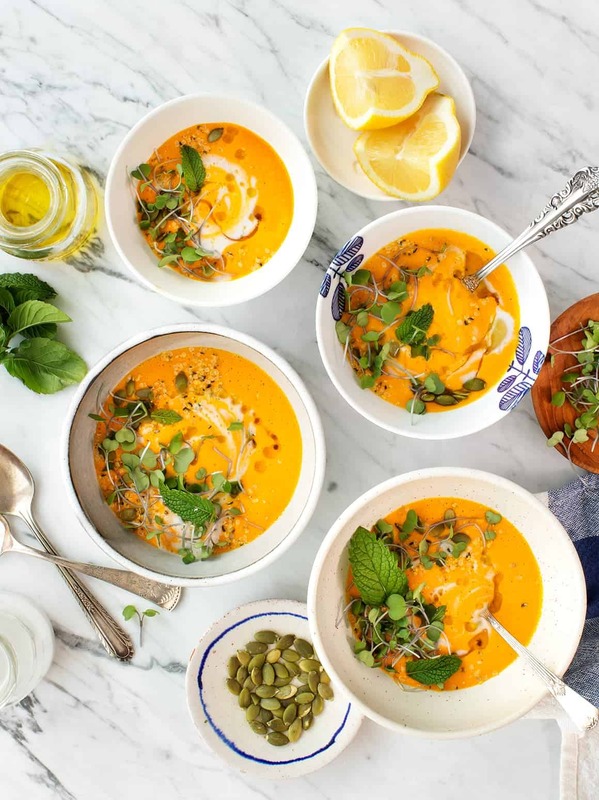 This heavenly carrot gazpacho requires just 10 ingredients and blends together in a flash. Refreshing, creamy & bright, it's wonderful warm or cold. It’s soup season! Well, it’s sort of soup season… one day there’s a chill in the air, the next day it’s warm and sunny. So here’s a soup that I crave no matter what’s happening outside. It’s meant to be served chilled but it could be just as easily warmed up. 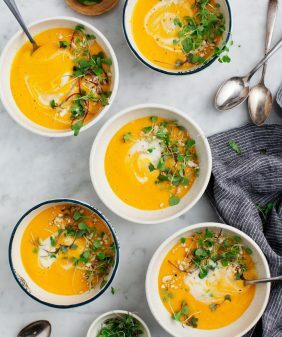 This creamy carrot gazpacho is one of my favorites from our first Cookbook. 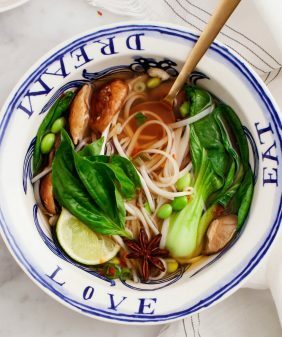 I remember when I first made it, I wanted to stop working on the book and just eat this soup every single day for lunch. It’s perfect with a slice of avocado toast on the side. 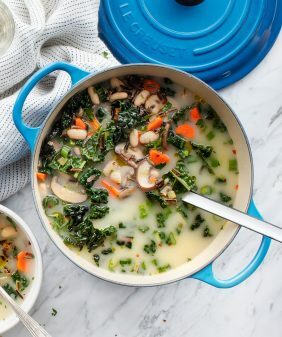 The soup is creamy from the coconut, and its bright flavor comes from the lemongrass and sherry vinegar. I like to puree it really smooth, then garnish with pepitas and fresh herbs for texture. 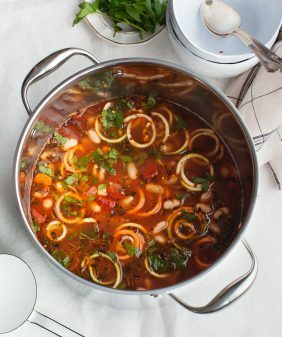 Tell me – what soups are you loving right now? 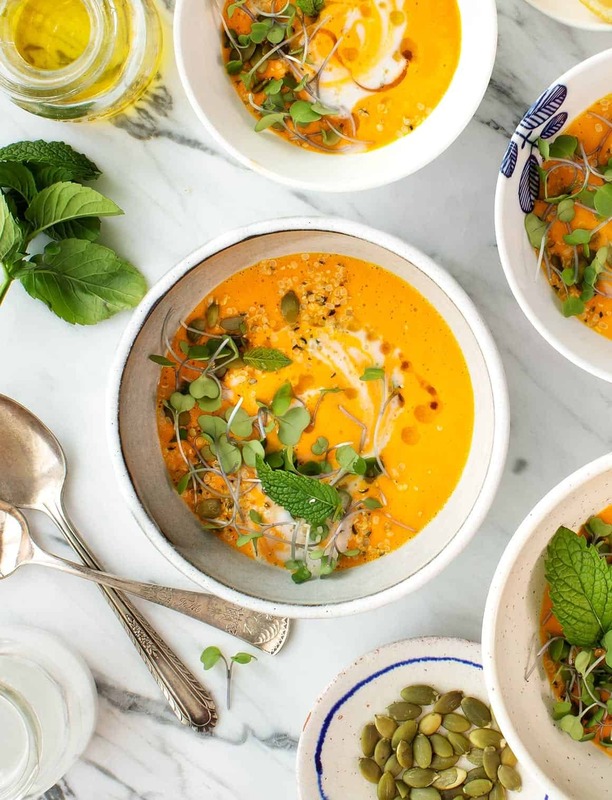 I’m all about this curried cauliflower soup, this lemongrass soup & this green gazpacho. 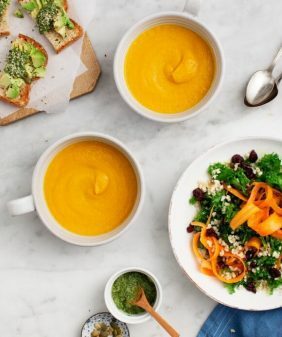 This soup is best made with a bunch of vibrant local carrots, but if you can't get your hands on some, it's still delicious. I like it cold in the summer and warm in the fall & winter. Prepare the lemongrass by cutting off the root end and tough upper stem of the stalk. Remove the first one or two layers of outer leaves and fin ely chop the tender, aromatic part of the lemongrass. 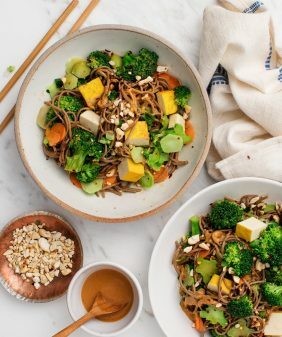 Using a high-speed blender, combine the lemongrass, carrots, coconut milk, garlic, olive oil, sherry vinegar, red curry paste, water, salt and pepper. Blend until smooth. If you're not using a high-speed blender like a Vitamix, strain the soup (if desired for texture) and blend again until completely smooth. Chill for at least 4 hours. If the soup thickens in the fridge, stir in a little more cold water. Alternatively, you can serve the soup warm by gently heating it in a saucepan. Season to taste with more salt and pepper. Drizzle with olive oil and serve with desired garnishes. Wow, this sounds so tasty – and I wouldn’t normally be a fan of Gazpacho – but you’ve made it sound yum! Oooh, love that it works heated up too! This looks amazing. I’ve never used lemon grass. Maybe now is the time?! Our entire family of seven loves homemade chicken noodle soup, from one-year-old Hannah, to 70-year-old Grandpa who comes over a lot for dinner. I like to add a few finely chopped pickled Serrano peppers to give it a little acidity and heat. Just made this!! What a simple and gorgeous dish!! So flavorful and bright!!! I will definitely be saving this for when I have guests! Thank you! Hi Line, yes, they’re raw, but you need to use a high powered blender, not a food processor. If you think your blender might not be strong enough, you could roast the carrots first to soften them. Hope that helps!